Training teachers as facilitators-leaders is the first step on the way to empowering the students and imparting significant, experiential, and fascinating learning, as a tool for assimilating a result-bearing change! Become an influential, meaningful and empowering figure in the lives of your students! Learn how to give workshops, lectures, fascinating and innovative courses and leave your mark on adults and the younger generation! Enrich yourselves with original games, exercises, stories, questionnaires, quizzes, studies and theories. Receive an ongoing supply of materials throughout the year for group work and one-on-one work. Upgrade Your Group Facilitation Skills to an Art! Once you have experienced the program firsthand, you will receive training on how to independently impart these tools to your students and children! Impart innovative tools from the field of facilitation through the use of games, stories, exercises, questionnaires, riddles, and innovative theories, to convey various messages in an experiential and meaningful manner. Learn original techniques to make your workshops fascinating, inspiring and meaningful (even if the subject matter is dry and dull). Learn how to present a topic in an unforgettable way and captivate an audience. Enrich your toolbox with inspirational stories, develop and play original and fun games, and choose the right icebreakers. Get to know the teacher/facilitator’s strengths while listening to ourselves and others, developing creativity, and maintaining the flame of personal and class motivation and enthusiasm. Receive optimal tools for facing an audience, for handling unexpected situations in the classroom, at the students’ level, while maintaining flexibility, sensitivity, and restraint. Conduct a shared dialogue with the students using a range of active listening techniques to empower the students and increase interest and challenge. Get to know the personal skills of the good facilitator. Empower the teacher as a person, as a professional, and as a parent, and then apply and adapt the material for the younger generation, to empower children and students through games, exercises, activities, stories, and innovative theories. Dr. Orly, your presence in the education system and in general is not only essential, but air for breathing! Thank you dear Orly! The course was fascinating! The way you convey messages in your course was a role model for me! The insight I received more clearly was that anyone can become the best teacher and facilitator! The facilitator everyone listens to, who sweeps the audience away! Anyone can be charismatic (it’s not innate) by practicing the skills of good facilitators and teachers. Yes, even I can be one, and it’s possible!!! It’s amazing to see how the 3 Conditions Model can work in practice. 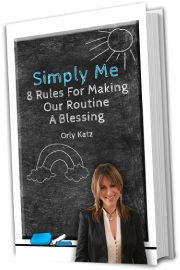 This is the second course I’ve taken with Dr. Orly Katz, and I enjoy every moment – listening to her life wisdom. Before the first session, I didn’t know what to expect, but very quickly I started understanding the potential of this course and its ability to help me at my work. I consider the 3 Conditions Model for Group Facilitation in this course to be the basis for any learning and teaching! Thank you! I’ve acquired lots of great tools here (this is my third course with Simply Me). Thanks, Dr. Orly, for providing tools for us as professionals – how to approach, how to convey a message, and how to conduct a great lesson.